Vast rock-cut temples and viharas dot the hills of western and eastern India. THE CHAITYA-GRIHA AT Bedsa, 1st century A.D. In ancient India, in the search for the truth, the emphasis was always on the effort that one had to make to gain knowledge. As at Bedsa, the "griha", or home of the object of worship, is partly hidden from the profane world outside. The belief was that one could learn truly or deeply only when one made a special effort for that purpose. IN western India, the 2nd century B.C. ushered in one of the greatest periods of the art of India and the entire art of Buddhism. Over a period of about 1,000 years, more than 1,200 caves were hewn out of the mountains of the Western Ghats, not very far from the coast of present-day Maharashtra. They were profusely sculpted and painted in the Buddhist traditions. Leaving behind the cares and confusions of the material world, the devotee came to these splendid havens of contemplation. The beginnings of this tradition appear to be in the caves excavated in the 3rd century B.C. by Emperor Asoka and his grandson Dasratha at Barabar in present-day Bihar. These caves were made for the Ajivikas, a deeply ascetic sect. Asoka also sent two missions to Maharashtra to spread his ethical message of dharma. While secular buildings were made of ephemeral materials such as wood, those made in service to the Eternal were carved in the hearts of mountains themselves. For almost 2,000 years of known ancient history, there was no focus on personalities, even rajas. It was the eternal truths, which were beyond the passing illusions of maya or mithya, that were the subject of art. Hence, only the homes of deities, which were used to personify the eternal concepts within us, were made in lasting materials. The first phase of prolific excavation was from the 2nd century B.C. until the 3rd century A.D. Great Buddhist prayer halls and viharas that housed monks were made under the rule of the Satavahanas and the Kshatrapas. Though these kings revered Hindu deities, they patronised all religious establishments. Individual sculptures and pillars were donated by merchants, bankers, gardeners, farmers, fishermen, housewives and others, including Yavanas, or Greeks. These cave sanctuaries were all made on the caravan routes from central India to the ports on the coast of Maharashtra. Perhaps it was the great prosperity on account of flourishing trade that made possible this era of magnificent rock-cut caves. Trade networks, internal and those with the Mediterranean, were expanding fast in this period. The Roman historian Pliny the Elder writes in 77 B.C. that Roman coffers were being emptied for buying too many fine textiles from India. About 100 years later, Emperor Vespasian (A.D. 69-79) forbade the export of gold to India to put a halt to the severe drain on the Roman Empire’s treasury. 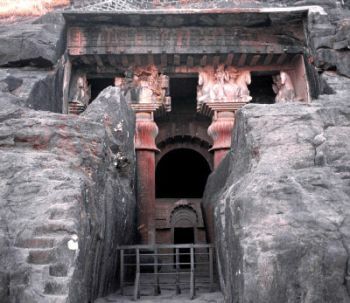 NASHIK CAVES, 2ND century A.D. A grand group of rock-cut caves is on top of a high hill on the outskirts of Nashik. These were made under the rule of the Satavahanas and are examples of the fine art of that period. 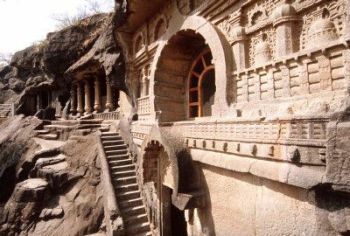 There are 22 rock-cut caves at Bhaja, facing the valley of the Indrayani river, in Pune district. The chaitya-griha, or prayer hall, here was made in the 2nd century B.C. Chaitya means an object of worship. The stupa deep inside continues to be the focus of devotion. The mortal relics of the Buddha were enshrined in a number of stupas, and for Buddhists the stupa became the symbol of his passage from the world of illusion and pain to that of eternal bliss. A horseshoe-shaped arch dominates the façade of the cave. The shape was first made in imitation of wooden architecture in the Barabar Caves of the Ajivikas. Soon, it was to be a pan-Indian motif in Buddhist, Jaina and Brahmanical monuments. It continued as a decorative motif in temples even through the medieval period. In the façade, human figures are made leaning over balconies. They convey a sense of the teeming abundance of life. The style is similar to the terracottas of the period. The scale of the hall is impressive. It is 55 feet by 26 feet (16.8 metres by 7.9 m) and rises to a height of 29 feet (8.8 m). Pillars, which run along the walls of the cave, provide a circumambulatory passage around the stupa. The pillars lean inwards in imitation of wooden architecture. Above, wooden ribs have actually been added to copy the appearance of free-standing buildings. Among the viharas here, Cave 18, which is contemporary to the grand chaitya-griha, is remarkable. On the right wall of the veranda are sculptural representations, identified as Brahmanical deities. One shows a royal figure driving a chariot through the skies. The horses trample underfoot a large, misshapen demonic figure. This may be the earliest surviving depiction of Surya, representing the sun, who vanquishes the demon of darkness. The panel on the right has been identified by some as the earliest known depiction of Indra, who rides an elephant. As in other reliefs of the Sunga period, the carving here is not very deep. The style is very similar to the moulded terracottas of this period. The elaborate headdresses, garlands and jewellery are typical. It is important to remember that, as with other early Indian sculptures, these would originally have been covered with plaster and painted. The earliest depiction of Indra, Bhaja caves, 2nd century B.C. 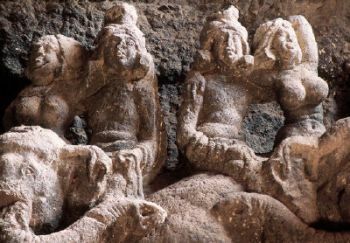 The vihara, Cave 18, at Bhaja has sculptures that have been identified as Brahmanical deities. 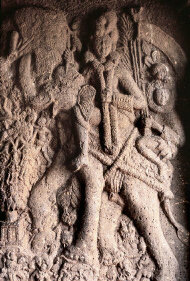 Surya and Indra, who rides an elephant, can be seen in the veranda of the cave. The style has similarities with the terracottas of the Sunga period. Indra continued to be popular in Buddhist art in subsequent centuries. He is also depicted as the one who, along with Brahma, receives Siddhartha on a cloth when he is born from the side of Queen Mahamaya. In a secluded gorge of spectacular natural beauty, about 50 kilometres northwest of Aurangabad, are the caves of Pitalkhora. Part of the hill-face has disintegrated, and the fronts of the caves have been lost. However, what remains shows that Caves 3 and 4 may have been the crowning glory of Buddhist art when they were made in the late 2nd century B.C. Paintings of the 6th and 7th centuries A.D. in the Cave 3 chaitya-griha show that the cave remained in use for at least 800 years. The conception of the entrance of Cave 4 is grand. It is as if the weight of the cave rests on the backs of life-sized elephants that have been made in the plinth. The idea is carried forward later, in the chaitya-griha at Karle and in the Brahmanical Cave 16 at Ellora. 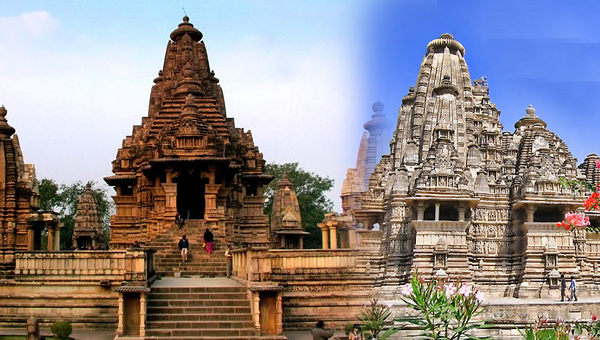 Subsequently, this concept continued in Indic monuments throughout the ancient and medieval periods. Lakshmi, embodying abundance, is made above the entrance. She is depicted often in the railings and gateways of the contemporaneous stupas at Bharhut and Sanchi. Gajalakshmi, where she is shown being lustrated by elephants, is one of the earliest formalised deities depicted in Indic art and is seen in the monuments of all faiths. Mithunas, Karle chaitya-griha. The façade and veranda of the chaitya-griha have many couples, filled with robust vitality. These are the “yakshas” and “yakshis” of early times, who are now seen together as loving couples. On either side of the entrance are two well-executed dvarapalas, or guardians of doorways. They are life-sized and appear wide-eyed and filled with youthful vigour. Among the many sculptures that have been found at the site is a grinning gana, a dwarf, as is seen at Sanchi. An inscription states that the sculpture was the donation of a goldsmith Kanhadasa, which means “servant of Krishna”, the Brahmanical deity. At Bedsa, on the south face of the same range of hills as the Bhaja caves, is another magnificent site of excavations. The grand chaitya- griha is partly hidden from the profane world outside by a large section of rock. In the Indic tradition, that which is important is always kept away from the glare of common sight. One has to make an effort to gain the joy and peace to be found inside. The magnificent chaitya-griha was made in the 1st century A.D. The pillars inside are the earliest seen pillars rising out of purna-ghatas, or “vases of plenty”. This became a common motif of Indic art from this point on. RANI GUMPHA, KHANDAGIRI, Orissa, Jaina caves, 1st century A.D. The rock-cut caves of the Jaina tradition are very similar to those of the Buddhist faith. Besides the philosophic concepts, the symbols and artistic motifs of both streams are the same in this period. For instance, there were many chaitya arches in the Khandagiri caves. On the pillar capitals are animals with riders, as are seen in the contemporaneous Sanchi stupa gateways in central India. It is a vision in which men, women and animals are in harmony with one another and with the world around them. The figures are self-assured. 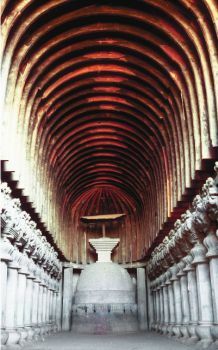 The side walls of the veranda have horseshoe-shaped arches, commonly termed chaitya arches, rising upwards to create an impression of a four-storeyed structure. The interior, dimly lit by light passing through the jali (window) in the front, is simple. Leaving behind the profusion of images and sculptures, the heart of the mountain contains the stupa. The pillars around it and in the hall are plain. The devotee has travelled from the world of illusory shapes outside to be closer to the truth in all its simplicity. A small group of caves, overlooking the stream of Ulhas, at Kondawane, near Karjat, was excavated in the 1st century B.C. Owing to the remoteness of the site, it seldom receives the attention it deserves. Despite its ruined state, the magnificent façade of the chaitya-griha exhilarates the visitor. The figures here have been delicately modelled and are graceful. There is a sense of natural ease in the depictions of these times. The men and women express emotions with a freedom and warmth not often seen in later representations. The figures made on the lower section of the façade have been lost, except for a defaced head. An inscription below the façade records it as the donation of “Balaka, pupil of Kanha”, a name of the Brahmanical deity Krishna. MITHUNAS, CAVE 3, Kanheri, 2nd century A.D. The sculpted figures of Kanheri display the robust health and vitality of the earlier figures at Karle. The style of the sculpture also has similarities with the contemporaneous art of the Mathura region in northern India. Next to the chaitya-griha is an impressive and spacious vihara. The ceiling has an elaborate imitation of a network of beams and rafters. 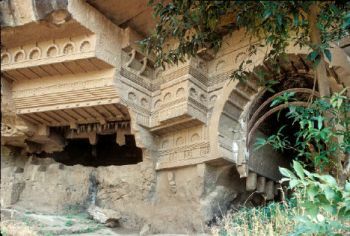 On a high hill, opposite the range that has the caves of Bhaja, a grand c haitya-griha and viharas were created in the 1st to 2nd centuries A.D. at Karle. This is the largest of all chaitya-grihas to be carved out of the living rock. One of its early inscriptions proclaim that it is the “most excellent rock-mansion” in all of India. Another inscription records the gift of the Hindu Ushavadata, son-in-law of King Nahapana: he donated the revenue of a village to support the monks at Karle. One must remember that these magnificent chaitya-grihas are not really architecture but sculpture on an epic scale. For the Indian artist, the rock contains in its heart the divine. It is for him to remove that which hides the image from our sight, to reveal the sacred nature of the hill. One can imagine how stupendous the task must have been to create such rock-cut shrines. Great care and planning would have been required at every stage of the enterprise. The cutting of the rock began from top to bottom: creating the spaces and leaving stone for pillars to be shaped later. Even as the stone was hewn to create the structures, the work of finishing the walls and carving detailed sculpture was taken up. This process is revealed by unfinished caves. As at Bedsa, the façade of the cave is mostly hidden from the mundane world by a rock-cut screen. A recent shrine today further blocks the view. Outside the courtyard were two columns, of which only one remains. 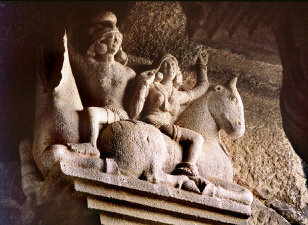 RIDERS ON ELEPHANTS, pillar capitals, Karle chaitya-griha. Figures full of the ease and natural grace of life are seen on the pillar capitals of the chaitya-griha. They are warm and uninhibited, and men and women are seen with their arms around one another. Women express themselves as easily and freely as men in the art of ancient India. There are large elephants on the side walls of the veranda, continuing the tradition seen at Pitalkhora. They appear to support effortlessly the many-storeyed structures carved above them. The façade shows six couples, larger than life and filled with robust vitality. These are the yakshas and yakshis, who embody the abundance and fertility of nature: the forces that ensure the continuity of life. They were seen individually in the gateways of the stupas of Bharhut and Sanchi. Here, they have come together as mithunas, or loving couples. Their closeness to each other in natural affection symbolises the completeness of the world, of the harmony of the natural order. The figures do not attempt to faithfully copy the human body. They are idealised forms, presenting the symbolic essence of human life. They are full-figured and firmly fleshed. They graphically display the quality of prana, or inner breath, of Indian art. The grand hall is 124 feet by 46 feet (37.8 m by 14 m) and rises to a height of 45 feet (13.7 m). There are 37 pillars, which run the length of the walls and around the stupa. Thirty pillars have purna-ghatas. These also have sculpted capitals. As in other chaitya-grihas of the period, the pillars around the stupa are plain. The rich sculptural qualities of the capitals and the close spacing of the pillars combine to create an effect of high relief, running down the length of the cave: an effect that is further enhanced by the wooden ribbing above. THE PEACE TO be found in the heart of the mountain. At Karle is one of the greatest rock-cut chaitya-grihas. This is of the 1st to 2nd century A.D. and is the largest to have ever been carved out of rock. The capitals have seated animals carrying human figures. The ones facing the central passage are superbly rendered elephants. Each carries two onlookers, usually a couple and sometimes two women. They are seated in a friendly embrace and display a rare warmth. Here are people as they are meant to be, uninhibited, easy-going and joyous. Inscriptions record the names of the numerous individual donors, including Greeks, who paid for the carving of various parts of the cave and its pillars. Worship continued at the site for at least 400 years, and there are also later sculptures of the Vakataka period on the façade. There are many small rock-cut caves on four hills close to Junnar, in Pune district. These were excavated from the 1st century B.C. to the 3rd century A.D. There are several viharas here, of which the largest is on Sulaiman hill. To the left of the vihara is a chaitya-griha with an inscription dating to the 2nd century A.D. It was a gift from a resident of Kalyana. Within the Borivili National Park in Mumbai is the Buddhist cave site of Kanheri. Amidst the natural surroundings, which have been well preserved by the national park administration, this site provides a view of developments in Buddhist art for a thousand years, from the 1st century A.D. onwards. Its proximity to the sea and thriving ports would have ensured its continual patronage. The caves at Kanheri present the last expressions of the early rock-cut tradition of western India. Simultaneously, this site heralds developments in iconography of the Buddhist art of the later period. The Cave 3 chaitya-griha was excavated during the reign of King Satakarni in the 2nd century A.D. It has a courtyard with a rock-cut fence around it. As in Karle, it has two pillars in front. One pillar has a representation of the Buddha, the earliest one in western India. Riders on horses atop tall pillars, Bedsa, 1st century A.D. Robust youth and vitality mark the figures and their animals, which are made at a great height, on the pillars in the front of the magnificent chaitya-griha at Bedsa. The style of the figures here has similarities with the contemporaneous sculpture of the Mathura region of northern India. The men and the women have a sense of the breath and movement of life. They display individual postures and have gentle expressions. Colossal Buddhas, who are later additions to the chaityas, are of the 5th or the 6th century. Later caves at this site present the pantheon of deities of the subsequent period of Buddhism. At the magnificent site of Ajanta, about 100 km from Aurangabad, in a horseshoe-shaped gorge of the Waghora river, are 31 rock-cut caves. The caves were excavated in two phases: once around the 2nd century B.C. and for the second time around the 5th and 6th centuries A.D.
Cave 10 is the earliest chaitya-griha here and was made in the 2nd century B.C. It has many similarities to other excavations of that period. The murals here are thrilling to see as they are the earliest surviving paintings of this historic period in India. These paintings show the remarkably high degree of the development of the art. They also display many similarities in the manner of headdresses and apparel with the contemporaneous sculptural reliefs of Sanchi. These murals are known to be the fountainhead of all the classic paintings of Asia. There are also paintings in this cave that were made about 800 years later. Cave 9 is a chaitya-griha of the 1st century. The façade has figures of the Buddha, which were added in the later period. In the meantime, in the 1st century B.C., near the east coast of India, Jaina rock-cut caves were being excavated under the rule of King Kharavela in Orissa. These depict the pan-Indian spread of ideas and motifs at that time. A shared philosophic and artistic tradition, from the west to the east of India, is displayed here. A magnificent chaitya-griha and vihara at Kondawane, 1st century B.C. These caves are not visited very often because of the long walk required to reach them. The Rani Gumpha cave at Khandagiri in Orissa is the largest and most elaborate excavation of all. It is of the Jaina tradition. The courtyard and two storeys of cells provide a view similar to the much later Buddhist caves at Ellora in western India. A new feature seen here are brackets incorporating figures. These were to become prolific in later Indian art. The arches above doorways imitate wooden forms and are similar to the arches seen at Buddhist chaitya-grihas of this period. There are narrative friezes sculpted at the entrance to the cells. These are deeply cut and present the sense of the overflowing abundance of the world, which is seen at contemporaneous Sanchi. The headdresses, ornaments and the style of the figures are also very similar to that of the Sanchi toranas, or gateways. The Sunga and Satavahana periods were an era of the prolific making of monuments. Here were formulated the themes and traditions of Indian art that continued in later centuries. There was a common artistic tradition and the same motifs were made in Buddhist and Jaina art. These included yakshas, yakshis and Lakshmi. While stupas with sculpted railings were made in central India, vast rock-cut temples and viharas were hewn out of the hills of western and eastern India. The railings of stupas and cave exteriors presented images of the world as seen around us. Deep within the heart of the mountain, one could contemplate that which was Eternal: that which was within. The stupa was simplicity itself. In the silence of the interior, it was a symbolic representation of the escape from the illusions of the material world.